The Asian Pacific Health Foundation is a non-profit organization devoted to advancing health and wellness for the vulnerable groups in San Diego by providing health education and free community health screenings for hepatitis B and C, diabetes, hypertension, cholesterol disorders and osteoporosis at community centers. One of the unique characteristics of our organization is the ability to reach high-risk populations through our mobile outreaches and extend our services to diverse communities residing in San Diego. The conditions we screen are silent diseases. Why silent diseases? They are devastating and have subtle symptoms that often go undetected for years until the affected person experiences the disease complications. This could be too late to treat! With early detection and treatment, these diseases can be managed with minimal drawbacks on quality of life. Our organization is devoted to early disease detection and health education to promote health wellness. In just 16 years of service, APHF has reached over 7500 individuals and connected over 4800 patients to needed care. Osteoporosis is one such silent disease. According to the International Osteoporosis Foundation, worldwide, 1 in 3 women over the age of 50 years and 1 in 5 men will experience osteoporotic fractures in their lifetime. Unfortunately, 80% of high-risk individuals who already had at least one osteoporotic fracture are neither identified nor treated. The prevalence of osteoporosis increases in the aging population. The problem is magnified in the United States due to the fast growth in the aging population; this trend is also mirrored in San Diego. In San Diego County, 13.1% of the population was age 65 or older in 2015. By 2050, this is projected to increase to 20%. The U.S. Preventive Services Task Force recommends screening for osteoporosis in women 65 years or older and in younger women whose fracture risk is equal to or greater than that of a 65-year-old white woman with no additional risk factors. Dual-energy x-ray absorptiometry (DXA) is considered the gold standard instrument for detecting bone density/bone loss. Getting a DXA scan before the recommended age or without risk factors is not easy as it can incur high copay or denial from insurance coverage. Thus, the possibility of early detection of bone disease is even less. 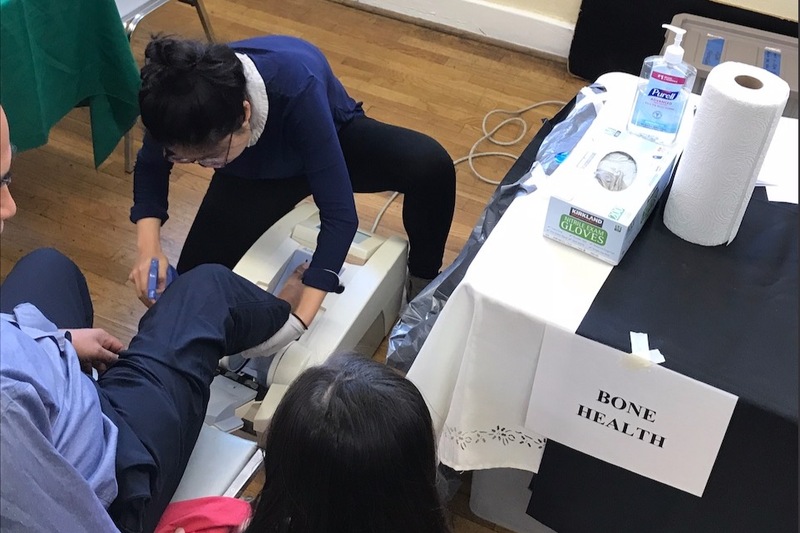 Over our most recent 8-month bone screening, we found that in participants at age 50 years and older, almost 1 in 3 persons is at risk of having osteoporosis. Through our freely available screenings, we were able to educate the affected individuals to take actions towards their bone health. 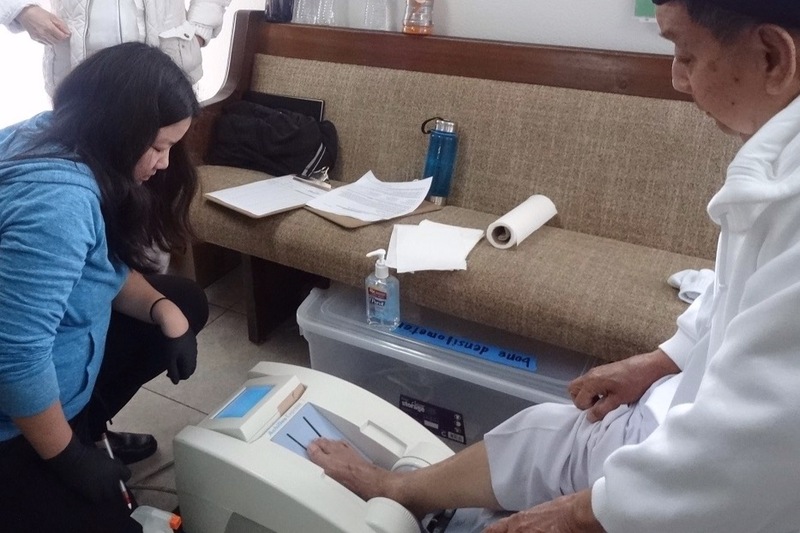 We utilized the GE Achilles Express Bone Densitometer for our bone screening. Studies have shown that this bone densitometer has over 90% sensitivity and specificity of detecting osteoporosis and identifying high-risk individuals. It is also non-invasive by measuring bone density by ultrasound through the heel. The results come within 1 minute! Its small size and portability make it ideal for us to transport to health fairs to screen the community. 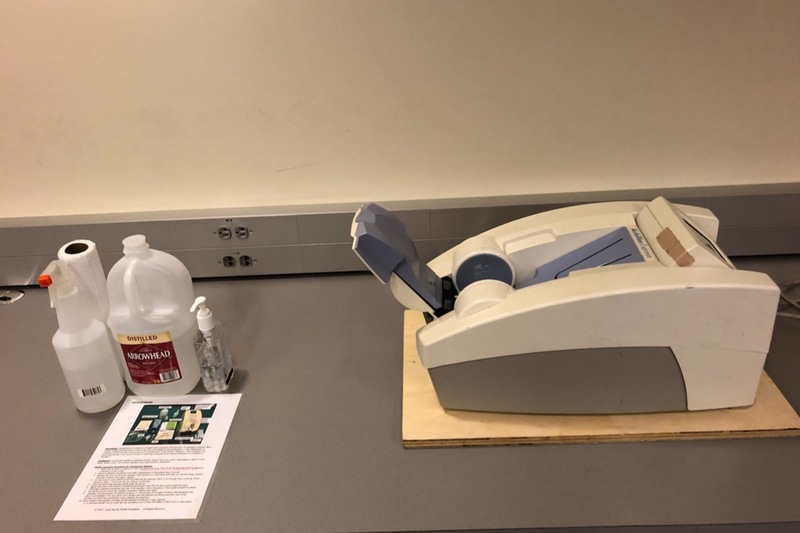 Unfortunately, our current bone densitometer is broken and not repairable. In order to continue providing these services, we are requesting assistance to purchase a refurbished bone densitometer ($4000). Any donation would be greatly appreciated and we thank you for your generosity. For more information about APHF, please visit our website at https://aphfsd.org/.